We have had a very busy December. Aside from our weekly district or zone meetings, we also enjoyed a 'senior retreat' with the older folks who are serving in so many ways here in the Berlin, Germany Mission. We appreciate ALL the well wishes via email and usual postage (we assume we got it all, but never know:-) ). We enjoyed hearing from so many during this Christmas and Holiday Season. Germany is really special during Christmas time, and we were pleased we were able to share so many things together and with friends and family. 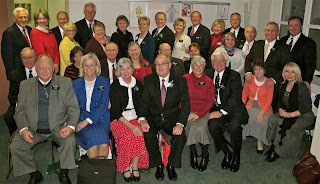 This is our Senior Missionary Group - 31 of us (15 couples & 1 Sister). 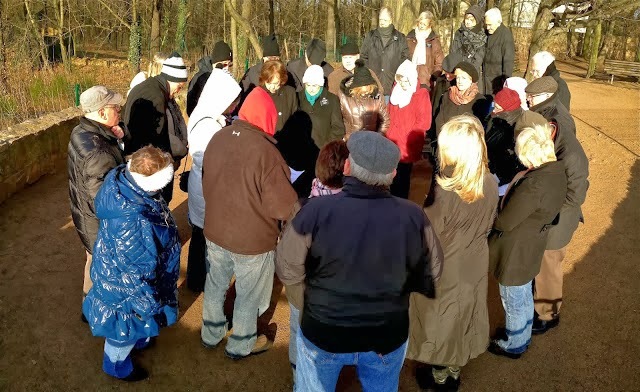 We met at the Stake Center in Dresden and it was a very uplifting and spiritual experience. 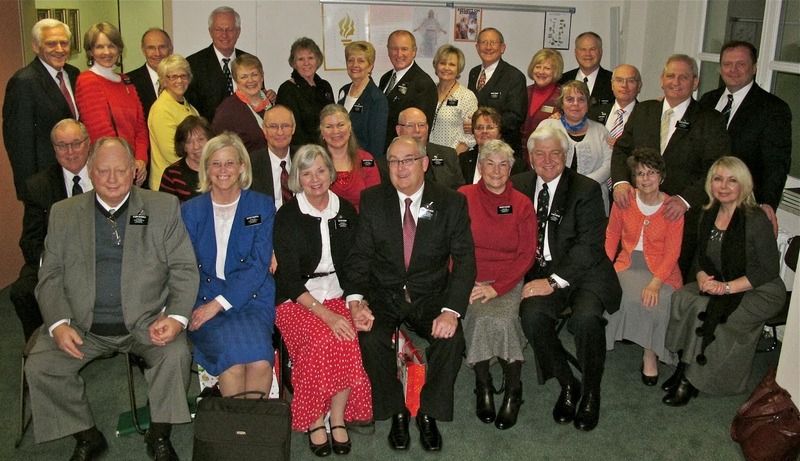 However, it was even more outdone the next day when we went to the hilltop where President Monson re-dedicated the Dresden Mission to missionary work. The place where President Monson said the dedicatory prayer was just below this water tower that has been in place for many years. It was a very picturesque place. President Kosak read the dedicatory prayer to us while she stood on the hillside overlooking Dresden. We are working on getting our own copy of the prayer as a keepsake for our mission and experiences. Brigitte met Sister Kessler while at this retreat. She is from the State of Washington, but met her husband in Duesseldorf. Her parents were building missionaries there at that time, and her husband to be was in the German Air Force. In any case, she knew Brigitte's family quite well and Sr Kessler also met Brigitte in Salt Lake many years ago. Did someone say, "It's a SMALL world."? She is now serving in Rostock where Sister Porter has a cousin, Jochen. We have visited them in the past during our trips to Germany, and Jochen and Heidi came to stay with us last May for a few days. We have high hopes we can open their hearts to listen to the Plan of Happiness/Life/Salvation:-) They can enjoy all of what our Father in Heaven has for us. Dadblasted PHONE - at least I'm not a technonerd. Techno just doesn't apply. One of the great pyramids from the Erzgebirge - Dresden is in this area and the Germans there make wonderful wood workings - especially for Christmas. The nutcrackers, pine trees, nativities, and a ton of etceteras of fine workmanship are all over the place during this market season. A very nice opportunity it get some nice pics while walking in the market place. And no - we didn't go away empty handed. However, I used to be able to hold my arms MUCH higher without difficulty. And - YES - I could say the same thing about my tummy:-) I knew you would ask yourselves that question. Looks like some amazing experiences and Dresden looks beautiful!